At the time of writing, the Washington Capitals have compiled a 3-0-2 record. They are tied for first place in the Metropolitan Division and are the only team in the Eastern Conference without a regulation loss, a streak they hope to continue tonight with a win over the lowly Edmonton Oilers. Where did these new Capitals come from–a much-improved team, and vastly different from the one that kicked off last season with a 1-4-0 start? The Capitals’ early struggles were never mitigated, as their defensive and even-strength shortcomings became increasingly evident with each game. These have since been addressed by Capitals brass through the offseason signings of Matt Niskanen and Brooks Orpik, and rookie Andre Burakovsky playing his way onto the opening night roster. But at the helm of this revamp is Barry Trotz, the former Nashville Predators coach snatched up by new GM Brian MacLellan. From his first day in Washington, Trotz has made clear his expectations and goals for the team. The Capitals, he believed, needed more than a structural change in coaching. They needed a change in team culture, on and off the ice, and in and out of the locker room. Trotz began instituting these changes in the offseason, from conveying his intentions in press conferences to assembling a leadership committee comprised of veterans old and new to the team. The Capitals’ on-ice product is reflective of these inner, systemic alterations. They’re one of the NHL’s best possession teams, with a Corsi and Fenwick of 52.4% and 52.9%, respectively. Save for an emotional, high-scoring matchup with the Sharks, they’ve allowed two goals or fewer in their other contests. Their power play remains dominant as ever, with a 25% success rate. Interestingly, their penalty kill is ranked higher than the power play: its 90% success rate is good for sixth in the League. The penalty kill underwent a number of Trotz-mandated changes, with the help of assistant coach Blaine Forsythe. Shot-blocking and aggression became staples of the Capitals’ play, not only when down a man, but in all situations. Despite a small sample size of five games, Trotz’s system has produced clear, positive results. It’s evident that Trotz is a man of careful thought, deliberation, and communication. From his hiring, the Capitals were aware of what was expected of them, from off-ice leadership to willingness to adopt yet another new style of play. Veterans like Jason Chimera and Brooks Laich and rookies Evgeny Kuznetsov and Burakovsky alike have enthusiastically complied and reaped the benefits. Despite the disparities in playing experience, the Capitals share a similarity in that they’re adjusting to yet another new coach. Dan Bylsma, Adam Oates, Kris Knoblauch–the names are familiar but have since been disregarded, particularly by the Capitals’ veterans. Trotz wasted no time is laying his ground in Washington. While Trotz isn’t in a managing role, it’s clear that he believes in the Capitals’ core, from its “Young Guns” to newer additions. Debate raged during the offseason over the Capitals’ future–whether the core needed to be blown up, or whether new management and coaching could return the team to Stanley Cup contenders. Throughout the discussions, however, were mentions of leadership. This was not lost on Trotz, who has yet to reveal the specific members of the leadership committee. However, speculation indicates that its members include Laich, Chimera, Nicklas Backstrom, Alex Ovechkin, Mike Green, Brooks Orpik, and Troy Brouwer. However, translating his ideas into results is Trotz’s ultimate goal. The Capitals’ locker room between periods is an undoubtedly different place than it was last year, but the tangible changes have already manifested themselves in their play. The wildly successful power play, a longtime Capitals trademark, is among the NHL’s best. In light of success, it’s easy to look at the present and future with rose-colored glasses. But the Capitals are familiar with and prepared for the realities of the NHL, from fluky bounces to inhumanly capable goaltenders. “On any given night, sometimes you get shut out. Sometimes you don’t get any power-play goals. Sometimes it happens, sometimes the goalie’s really good,” Chimera added. Trotz’s approach is grounded in consistency, but he recognizes the importance of adaptation. He’s mixed up the lines to ignite chemistry, and didn’t hesitate to pull Holtby in a topsy-turvy game against the Sharks. Some methods are unconventional, like Mitch Korn’s use of goalie-training props, but the Capitals have full trust in their coaches. 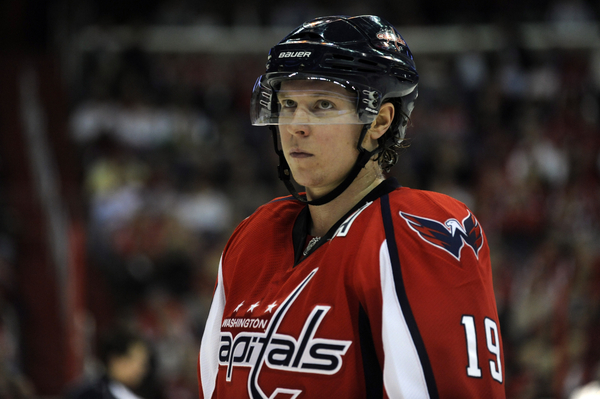 From Eric Fehr to Ovechkin to Laich to Burakovsky, a number of them were reassigned positions. For some players, their new slots were familiar, while others struggled to adjust. Burakovsky also credits the management for helping him to develop. Last season, he overcame his initial reservations about playing in North America, a far cry from his native Sweden, to enjoy tremendous success with the OHL’s Erie Otters. After impressive rookie and training camps, which earned him praise from Trotz, Burakovsky realized the full extent of his shift to the NHL. “Erie was really good. Now, coming here with new linemates and new coaching staff, everything feels really good. I think the future looks really bright,” he said. Ultimately, however, the Capitals’ successful ability to change can be boiled down to a combination of experience, coaching expertise, and work ethic.